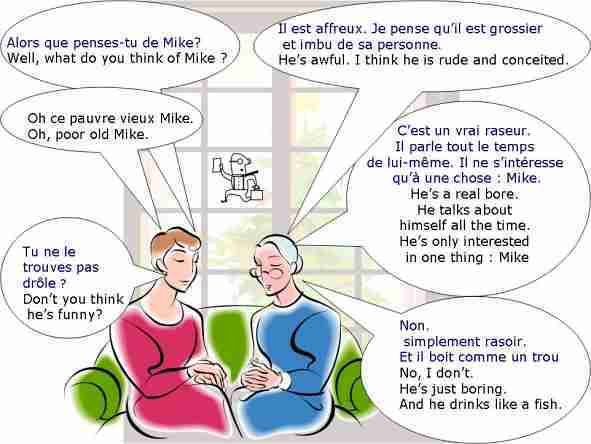 Learn English > English lessons and exercises > English test #6337: Dialogue : What do you think about...? Dialogue : What do you think about...? Well (what do you think of) a nuisance a pretentious man all day long displeasing how do you find incorrect is often drunk laughable terrible unlucky I don't know Mike ? He is (awful) a nuisance a pretentious man all day long displeasing how do you find incorrect is often drunk laughable terrible unlucky I don't know . I think he is (rude) a nuisance a pretentious man all day long displeasing how do you find incorrect is often drunk laughable terrible unlucky I don't know , and (conceited) a nuisance a pretentious man all day long displeasing how do you find incorrect is often drunk laughable terrible unlucky I don't know . -Oh (poor old) a nuisance a pretentious man all day long displeasing how do you find incorrect is often drunk laughable terrible unlucky I don't know Mike, he is (a real bore) a nuisance a pretentious man all day long displeasing how do you find incorrect is often drunk laughable terrible unlucky I don't know . He talks about himself (all the time) a nuisance a pretentious man all day long displeasing how do you find incorrect is often drunk laughable terrible unlucky I don't know . Don't you think he is (funny) a nuisance a pretentious man all day long displeasing how do you find incorrect is often drunk laughable terrible unlucky I don't know ? He is just (boring) a nuisance a pretentious man all day long displeasing how do you find incorrect is often drunk laughable terrible unlucky I don't know , and he (drinks like a fish) a nuisance a pretentious man all day long displeasing how do you find incorrect is often drunk laughable terrible unlucky I don't know . End of the free exercise to learn English: Dialogue : What do you think about...?